A beautiful, delicate sounding Bleikristall German Crystal Bell. 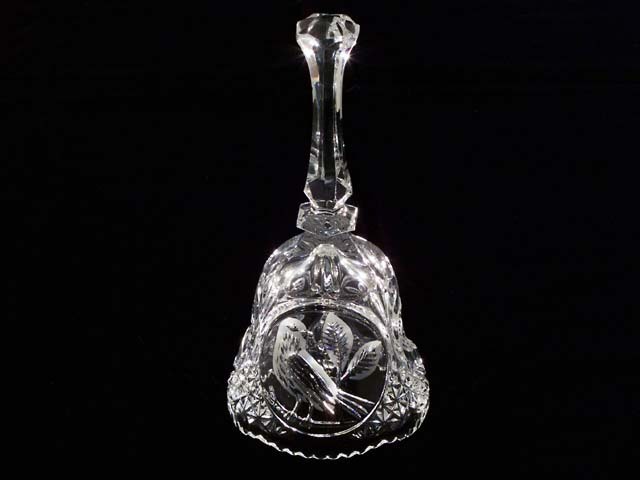 Highest quality leaded crystal bell by Bleikristall in Western Germany. Each third of the bell has a circle surrounding a beautifully cut finch standing on a limb with two leaves. The handle is hexagonal and the lip of the bell is scalloped. Clapper is a six glass bead chain. The bell is very clear crystal with no bubbles and rings nicely. Stands 8" Tall and is 3 3/4" in diameter. A great gift or addition to your vintage lead crystal bell collection........$35...Sorry!!! SOLD!